Vanish a coin and make it appear under a spectator's watch! This is coin magic that gets explosive reactions. If you want to own your audience's attention, there's no better choice. The video goes in-depth, teaching everything you need to know to perform this killer routine. COIN UNDER EVERYTHING - A stand-up sequence that has inspiration from Goshman. 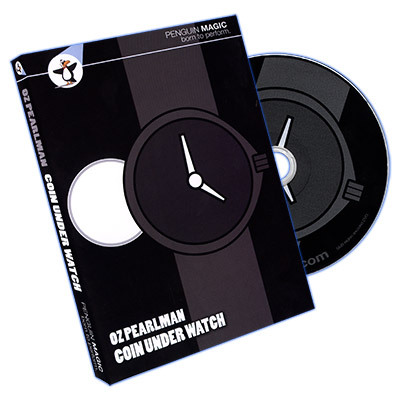 A coin continues to vanish and appear under objects on the table, in spectators pockets and finally under their watch. 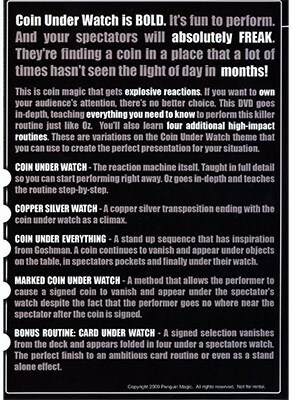 MARKED COIN UNDER WATCH - A method that allows the performer to cause a signed coin to vanish and appear under the spectator's watch despite the fact that the performer goes nowhere near the spectator after the coin is signed. BONUS ROUTINE: CARD UNDER WATCH - A signed selection vanishes from the deck and appears folded in four under a spectators watch. The perfect finish to an ambitious card routine or as a stand alone effect.